The Search Engine Journal was kind enough to interview me about various SEO topics, including: evolution of SEO, using UGC to drive SEO, Domainers vs. SEOs, and making the transition from in-house SEO to out-house SEO (working out of my house as an SEO consultant). 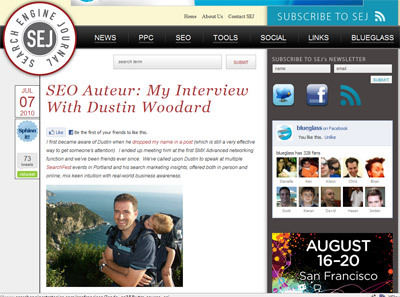 Besides learning more about me, I think you’ll find some helpful SEO tips inside both interviews. Previous PostPrevious Wondering What t.co is?